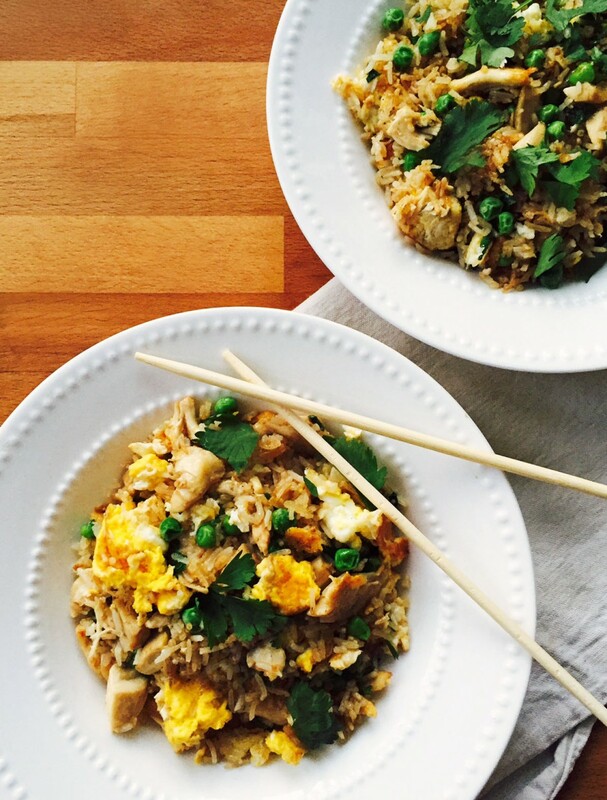 Fried rice is the very best vehicle for leftovers, and the ultimate cheap fast food. The trick to fried rice is starting with cold rice – and long grain. Sticky rice clumps together, as does warm, freshly cooked rice. But once cooled, the grains separate, making them easy to quickly stir-fry in a hot pan. I love my big, heavy cast iron, but any large skillet will do; set it over medium-high heat, add a good drizzle of canola or other vegetable oil, and a smaller drizzle of sesame oil if you have some – just for flavour. Dump in as much rice as you want to cook, without crowding the pan too much, and start to stir it around to heat it through, letting it get a bit golden around the edges. Push the rice over in the pan and crack a couple eggs into the space; cook and scramble them, stirring back into the rice as the fluffy curds cook. Chop and add leftover roast chicken or pork, or add some crumbled sausage, roasted veggies, or raw or cooked shrimp. Shake in some frozen peas, straight from the freezer – they’ll cook in a few minutes just with the heat of the pan and the rice. Drizzle over some soy sauce to season, and if you like, toss in a handful of cilantro. It’s a satisfying way to cook, and you can make as much or as little as you want – it’s perfect when you want to make a real meal for one, but it’s just as easy to make enough for five. What’s your go-to? Or favourite way to recycle leftovers into something new? One of the reasons that I started following — and that this has become my favorite blog — is precisely because so many of your posts are normal, weeknight-type ideas! I love fried rice (I let it get suuuper crunchy in the skillet by drizzling sesame oil around the sides of the pan while the rice is frying and letting it sit, undisturbed, for about 5 minutes) but my favorite go-to, clean-out-the-fridge food is empanadas or strombolis. Dough + leftover roasted vegetables + protein and any random scraps of cheese = lunch for the week! And fried rice always seems a bit fancy although it’s leftovers and improv’. A bit of garlic, ginger and a final sprinkle of sliced scallions are nice too. For some reason it doesn’t feel complete without a handful of frozen peas. I need to serve it on an old Chinatown platter. A couple of shrivel-y brown creminis or a dried shitaki can flavour a whole batch. I make a yummy bacon, bbq duck and mustard greens fried rice when there is a ton of giant red mustard in the summer garden. My brother still talks about the fresh crab fried rice he was served at a remote B&B on a bucket list trip to Haida Gwaii. Great photog’s. I could eat a plate of fried rice right now! Wouldn’t that be an amazing frosty morning breakfast? A perfect mid January post. I love frugal, resourceful “recipes” like this – especially with the current economy, and the prices at the grocery store. Thnx! I find pasta (especially homemade orecchiette) is like that too – as long as there is olive oil/butter, garlic, and a scrap of hard cheese (or even salty toasty bread crumbs if there is no cheese) – a tasty meal can be thrown together with leftovers, stray veg (or summer veg patch) and pantry stuff. LOVE fried rice any time! My husband usually does the honors and it’s never the same way twice. Our go to for leftovers is Jambalaya, rice again as the main ingredient and then a little bit of this and that and before you know it’s a meal for 3 or 4 or 5 or 6…..
There’s always cold rice in our fridge and I have some beef dip beef leftover… think that I know tonight’s dinner in between school & night time activities! Made this for a quick dinner last night – added some sliced leftover steak for the fella and left my portion veggie…..am inspired by your new design and more frequent posting! Gives me ideas for the never-ending question of “what should I make for dinner?” 😉 Thanks for the great blog! Aw thanks en! You made my day! So happy to see so much from you, love your recipes, stories and ideas. You’ve made 2016 great so far! I love that you’re posting daily again Julie. Missed you.